Agriculture is a major source of income for Arkansas, according to the official state website. Arkansas has a moderate climate and grows some of almost every major cash crop in the United States except citrus. This includes cherry fruits. The soil in Arkansas ranges from a heavy clay soil in the Ozark and Ouachita mountains to silty soil of the delta. To grow cherry trees in Arkansas, you must determine which type of soil you have, and amend it so that your trees will thrive. Select a location for your orchard that has full sun and well-drained soil. The roots of cherry trees may rot in standing water. If your location contains heavy clay, you may have to amend the soil to improve drainage. Indications of heavy clay soil in Arkansas include a red color and a sticky texture when wet. Have a sample of your soil analyzed by the University of Arkansas Extension service. To do this, pick up a soil sample collection box from the nearest Arkansas County Extension service. Dig a tablespoonful of soil from the surface of your site. Then dig down to a depth of 6 inches and take a second tablespoonful of soil. Repeat this process in several locations around your orchard location. Mix your soil samples thoroughly and then spread them across a piece of newspaper in a warm, dry, well-ventilated room. When the soil samples are dry, place them in the collection box and take them back to the county extension office. An agent there will help you to fill out the accompanying paperwork and send the samples to the state soil testing laboratory. The results of the test will tell you the type of soil that you have, as well as the nutrient content of the soil and its pH. Based on the results of your soil test, purchase soil amendments to improve the makeup and structure of your soil. If your soil contains heavy clay, you can improve the drainage by mixing gypsum, sand and organic amendments such as compost and peat moss in your soil. Silty soils need organic amendments including compost and peat moss to make them loamier. Cherry trees prefer a pH that ranges from 6.2 to 6.8. If your pH is higher, you should add powdered sulfur to lower the pH. If your pH is lower, powdered limestone will raise the pH. Plow your orchard to a depth of 8 inches using a rototiller. Then spread your amendments over the soil to a depth of 3 inches. Mix your soil amendments with the soil by running your rototiller over the soil again. Select cherry tree varieties that are adapted to grow in Arkansas USDA hardiness zones. Arkansas’s hardiness zones range from zone 6 in the northwest portion of the state to zone 8 in the southern portion. Additionally, Arkansas has long, hot summers, which some varieties of cherry trees cannot tolerate. Ornamental cherry trees such as Weeping Higan Cherry and fruiting cherry trees such as Wild Black Cherry both grow well in Arkansas. Dig a planting hole for your cherry tree that is slightly larger in diameter, but no deeper than the root ball of the tree. Pull the root ball from its container or wrapping and gently loosen the roots. Place the tree in the planting hole and cover with soil. Water the cherry tree with just enough water to keep the soil as damp as a wrung-out sponge. 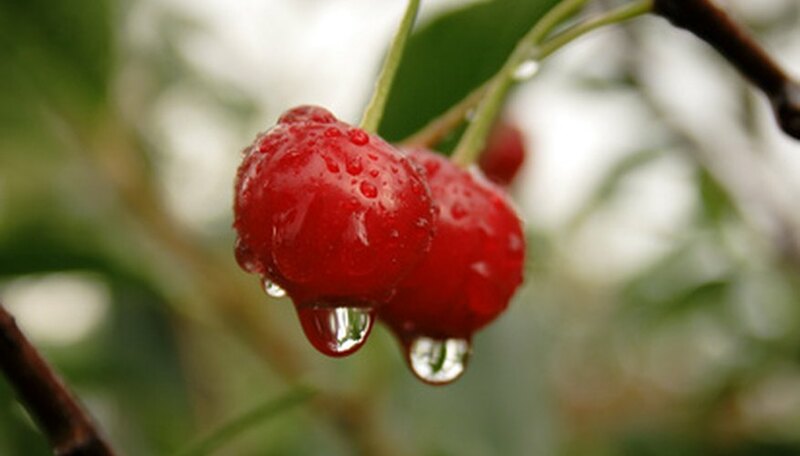 Water cherry trees in the summer months to plump out the fruit and keep the tree healthy. Pick the fruit as it becomes ripe. Spread a low-nitrogen granulated fertilizer (3-1-2) in a ring around the drip line of your tree each spring. Washington State University Extension: What's Bothering the Cherry Tree?